Oliver Willert, age 91, of Kadoka, South Dakota, died on Friday, March 25, 2016, at the Kadoka Nursing Home in Kadoka. Oliver Willert was born on November 11, 1924, at the family farm house west of Belvidere. Oliver was the second of five sons born to Emil and Etta Willert. Growing up the family lived on a farm north of Belvidere, where Oliver’s son, Jim, now lives. Oliver enjoyed living in the country where the family farmed wheat and hay. When he was young, most of the farm work was done with horses. Oliver attended a country grade school not too far from home. The family made the move to Kadoka in 1936 when Emil became sheriff and Oliver graduated from Kadoka High School in 1941. During his high school days Oliver played football and baseball. Oliver joined the Army in 1946 and served in World War II. He played football in Germany while stationed there. Oliver attended South Dakota School of Mines and played football there as well. They played nine man and his position was the outside end. 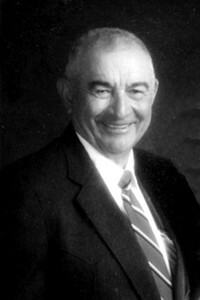 He graduated from the School of Mines in 1951 with a degree in civil engineering. On May 26, 1951, Oliver married Shirley Addison. Together they raised two boys, Jerry and Jim. With his engineering degree he had the opportunity to work road construction in South Dakota and Iowa. Later he took a job with the South Dakota Department of Transportation. He had a lot of responsibility as part of the engineering department and he helped oversee the construction of Interstate 90 in the 1960s from Cactus Flat to Kennebec. After his work on the interstate, Oliver worked as the resident engineer for the SD DOT office in both Kadoka, and later, for four years in Winner, SD. Oliver retired from the SD DOT after 20 plus years. During those years he experienced many changes in the equipment used and the process of how transportation projects were done. He was able to meet and work with a lot of people who he remained close friends with. He was also able to work on projects with his brother, Charles, and even spent a summer with his son, Jim. Raising two boys kept life busy, especially since they were in rodeo. Oliver went to watch them whenever he had a chance and in later years he followed his grandsons as they competed. Oliver loved playing all types of card games including cribbage, poker, and pinochle. He was an active member of the Belvidere Community Church, the American Legion Post #27 of Kadoka, and the VFW Post #4674 of Winner.